Vocativ reports on the rise of the Health Industry’s misdiagnosis of intellectual disabilities. Rates of special needs students are dropping, even as autism rates rise. Autism isn’t on the rise—but autism diagnosis is. Here’s how that works: In 1975, physicians examined thousands of children every year who exhibited signs of autism—the sort of symptoms on the autism spectrum that any modern doctor would flag accordingly. But back then, doctors often classified autistic children as “intellectually disabled” or “learning disabled”. Those children received special attention in school under the U.S. Individuals with Disabilities Education Act—the same attention afforded to autistic children—but they were never officially labeled “autistic”. Over the past fifteen years, our understanding of Autism Spectrum Disorder has evolved dramatically. Because of some recent, controversial changes to the Diagnostic and Statistical Manual (DSM-V), more children than ever are being diagnosed as autistic, because what constitutes autism has been redefined. 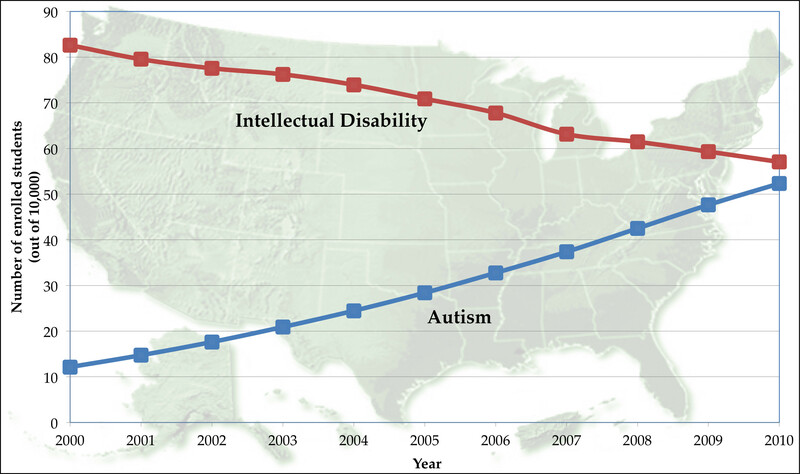 That could fool some parents into thinking that autism is on the rise, even when it’s not.